HandBrake Saves DVD Video as M4V not MP4 on Mac/PC – Why and How to Play it? Why Does HandBrake Save DVD to M4V not MP4 Video File? It answers why HandBrake saves DVD to M4V, but not MP4 file format and suggests the best solution to cope with this HandBrake DVD ripping error. Q: I've started becoming more familiar with using HandBrake to rip DVD on my computer (running Mac OS). But found that HandBrake occasionally defaults the destination file to be in the file extension of M4V (.m4v) instead of MP4 when I tried to convert DVD to Apple TV. Why? How can I open M4V file with general video players? If you invovle in the same trouble as the above question, read on to find out why Handbrake saves DVD as M4V not MP4 file, how to slove HandBrake saving DVD as M4V issue with the best HandBrake Alternative. M4V file extension is an MPEG-4 Video file. It is open in iTunes by default. An m4v file is more likely to have video ID3 style tags embedded. But mp4, m4a and m4v are all variations of the exact same file type in the long run. Why does Handbrake (currently 1.2.0) save video as M4V instead of commonly seen MP4 file? Indeed, M4V is barely more an Apple thing than HandBrake. M4V format is developed by Apple and encrypted by the same with DRM copy technology. That is to say, M4V files have copyright protection from Apple, which forbids the access (especially from competitors like Android) for commercial purpose. For example, M4V file cannot be read on Samsung Galaxy Note. Rip DVD or Convert Video to MP4 with Best HandBrake Alternative! WinX DVD Ripper Platinum - Best HandBrake DVD Ripper alternative to rip any (copy protected) DVDs to MP4 on Windows 10/8/7/Vista, macOS Mojave and lower. VideoProc - Best HandBrake Video Converter alternative to convert any video from or to MP4, M4V, MKV, MOV, FLV and so on. It can also download, edit, and record video. Disclaimer: Digiarty Software doesn't advocate ripping copy protected DVDs or downloading online videos for commercial purpose & suggests referring to related laws in your country before doing so. How to Open and Play HandBrake M4V File? Apple TV needs the .m4v file extension to know how to deal with the AC3 in the mp4 container. Chapters and AC3 audio can only be seen by QuickTime if you change the file extension from .mp4 to .m4v. 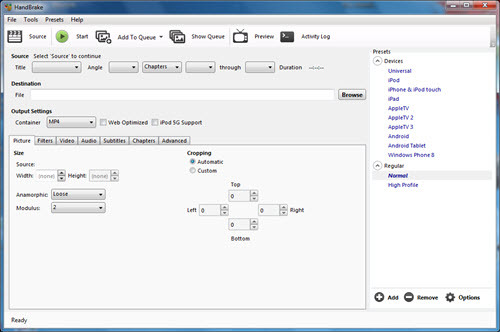 QuickTime or any QT-based app cannot play a MP4 file with these features enabled, unless it has the extension ".m4v". So you should not change to MP4 the extension of a file if it is as M4V containing a3c audio. That's why the Apple TV preset changes it in the destination field. >>How to Free Rip DVD to Apple TV? The simplest way to open and play M4V file is to change the file extension back and forth between M4V and MP4. That is, HandBrake M4V to MP4, or HandBrake MP4 to M4V. To the file extension from M4V to MP4 is the simplest but not an omnipotent way to play HandBrakde M4V file. In order to solve HandBrake Saving DVD as M4V issue flawlessly, the following solutions highly recommended. Find the best HandBrake alternative (such as WinX DVD Ripper Platinum for Windows and WinX DVD Ripper for Mac) to rip DVD to MP4/H.264, AVI, MPEG, WMV, etc directly. They can also convert DVD for movie playback on all iPhone, iPad, iTouch, iTunes, and any other popular Android and Windows devices. They also support ripping DVD to ISO, MPEG2, MP3, JPEG, or converting DVD ISO to AVI, MP4, and so on. In addition, WinX DVD Ripper Platium/for Mac fully supports Disney and Sony protected DVDs, and can select the correct main movie title by default during ripping. Joined Digiarty for 4 years as a website editor and technical writer, she focuses on giving readers all-around but lifestyle tech reviews & tips on hot gadgets and multimedia solutions. In the leisure time, she has a mania for travelling, baseball and transcendental meditation. Here's guide of how to free rip CSS copy-protected DVD with VLC and HandBrake and recommends the best alternative for ripping any DVD faster and easier. How to Solve "HandBrake Won't Rip DVDs with Copy Protections"
If you can't rip a Disney DVD with HandBrake, check whether the DVD is copyrighted and remove region codes, Disney DRM and any other encryptions with best alternative. HandBrake Cannot Passthrough Video / DVD. Why and How to Fix?